Single runs in the eight and ninth innings give the Indians a 5-4, come-from-behind win. CLEVELAND — Brandon Guyer scored when first baseman Brock Holt threw away Roberto Perez’s bunt in the ninth inning, lifting the Cleveland Indians over the Boston Red Sox 5-4 on Monday night in a matchup of first-place teams. After Guyer’s leadoff double against Brandon Workman (0-1), Holt fielded the bunted ball and tried to throw out Guyer at third. Guyer slid into the bag as the throw skipped past third baseman Rafael Devers, then got to his feet and raced across home plate. Teammates ran onto the field and doused Perez with water and white powder. Perez also had a three-run homer in the second inning. Cody Allen (1-6) allowed Christian Vazquez’s leadoff single in the ninth, but retired the next three hitters. The inning ended when shortstop Francisco Lindor ran down Mookie Betts’ popup in center field with his back to home plate. Cleveland relief ace Andrew Miller left in the seventh inning after aggravating the patellar tendinitis in his right knee. Miller recently returned after over two weeks on the disabled list with the knee injury. 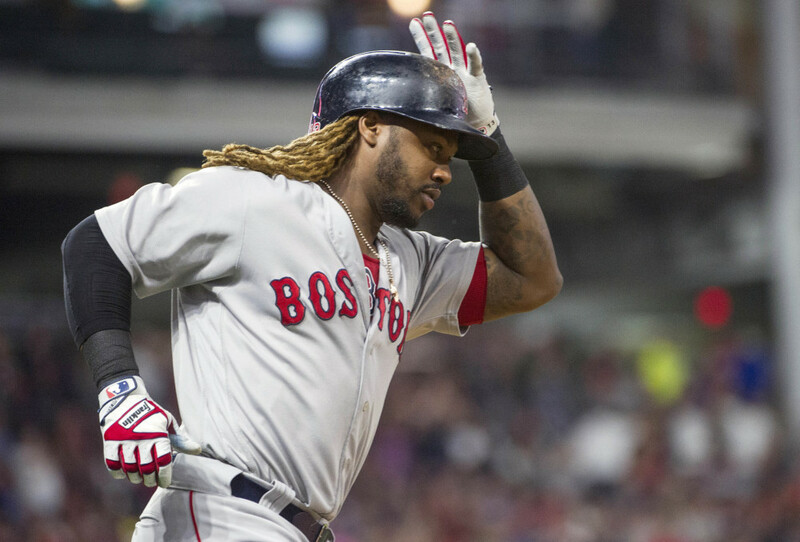 Boston led 4-3 behind two-run homers by Hanley Ramirez and Andrew Benintendi before Edwin Encarnacion tied the game in the eighth with an RBI single. Holt replaced Mitch Moreland, who was a late scratch because of a sore neck. Moreland took a forearm in the back of the head from Holt on a play Sunday. Manager John Farrell said Moreland passed concussion tests, but he decided to hold him out of the lineup. Ramirez’s fifth-inning homer made it 4-3. Benintendi hit his homer in the first. Plate umpire Hunter Wendelstedt left the game after being hit on the mask by a warmup pitch in the sixth inning from Red Sox reliever Joe Kelly. Indians first baseman Carlos Santana also left the game with an injury, exiting in the eighth inning with lower back tightness. 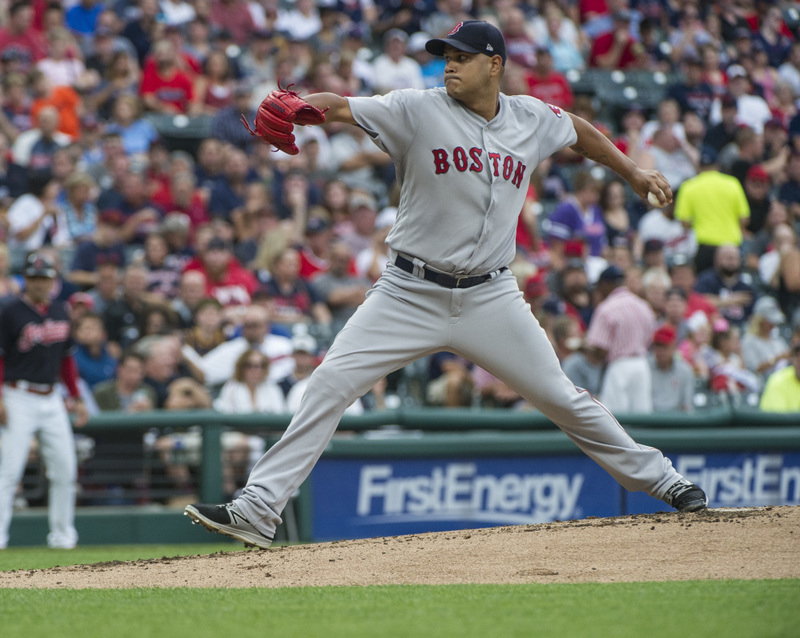 Eduardo Rodriguez allowed three runs in 5 2/3 innings for Boston. Mike Clevinger allowed both homers and gave up four runs in 4 1/3 innings for Cleveland. Jay Bruce was 1 for 4 in his first home game since being acquired from the New York Mets on Aug. 9.